The fiber from the berries and oatmeal, the protein from the milk and yogurt, the pure awesomeness that is frozen bananas – all combine to make the perfect satisfying grab-and-go breakfast. Don’t have a frozen banana on hand? Just substitute half a fresh banana and add a half a cup or so of ice before blending. My blueberry bush finally has blueberries! I planted it three years ago, and nothing … nothing … and then this year: bam! Blueberries! So exciting. Except … well, crap. I’m moving. Naturally. And the blueberry bush has to stay. But. But! Our new house? A dozen, maybe more, mature raspberry plants line one of the fences in the backyard. 20 feet, maybe more, of pure happy raspberry bliss. So, you know what? I’m good with this trade. And there will be plenty of room for blueberry bushes, too. Lots of them. I promise, though, she’s wrong. This smoothie is quite the opposite of garbage. The fiber from the berries and oatmeal, the protein from the milk and yogurt, the pure awesomeness that is frozen bananas – all combine to make the perfect filling, satisfying, grab-and-go breakfast. And it takes, oh, maybe 5 minutes to make. Total win. Totally not garbage, Toddler! Oh, and plus, it’s a really pretty color. So it’s nice to look at, too. 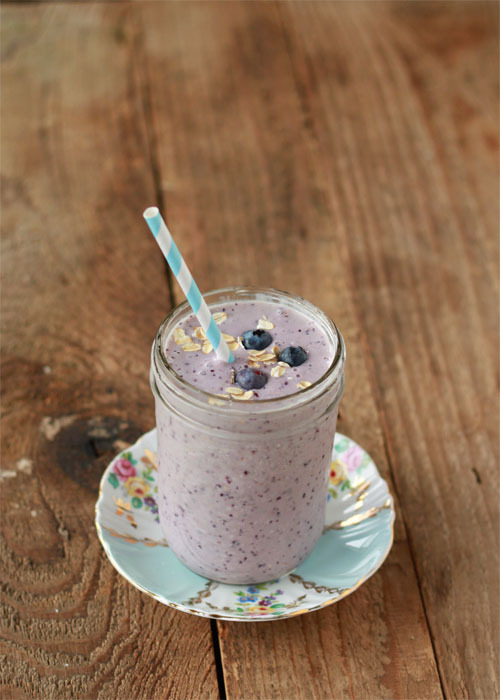 With the oatmeal, the texture of this smoothie isn’t perfectly smooth – I like that, though. It makes it seem more hearty. If you’re unsure, try soaking the oats with the milk overnight first. 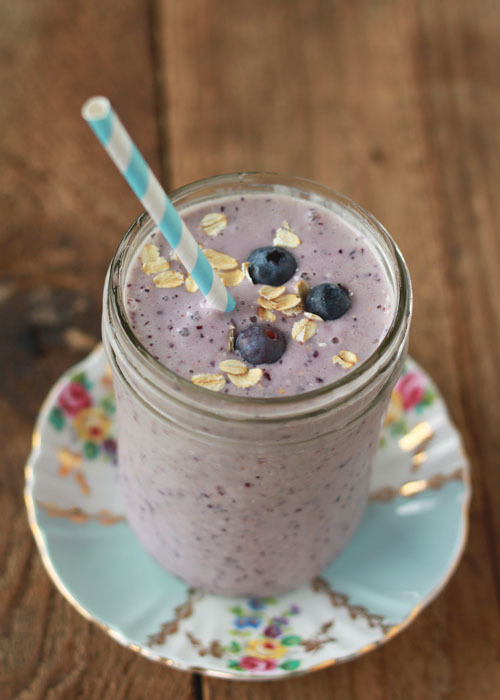 That should soften your oats right up and give you the smooth smoothie you desire. Place all ingredients into a blender and puree until smooth. Pour into a glass and serve with a straw. Haha, the things that toddlers say! That’s funny. 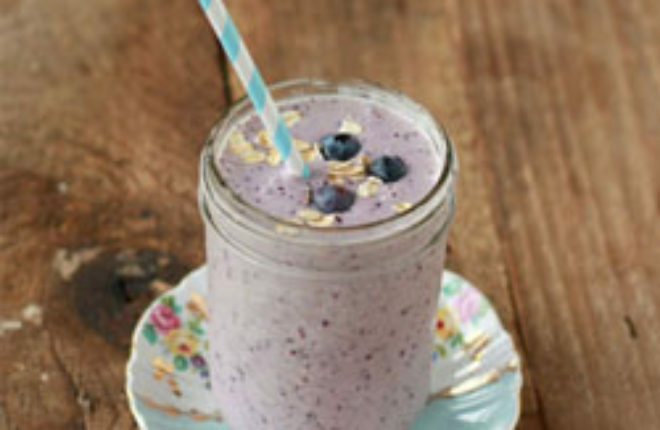 This smoothie looks like the perfect on the go breakfast though. Yummy! Oh, and exciting about the raspberries! I really want to plant blueberries but I know they take a while to produce so I’ll have to be happy with just raspberries for a while too 🙂 Figures yours start producing just as you’re leaving, lol, I’m afraid that’s going to happen to me! Unless there’s something in your selling contract I don’t see why you can’t dig up that blueberry plant and take it with you. We have about a dozen blueberry plants, some earlier and some later varieties. The later varieties are nearly ripe. We have a net over them to protect them from hungry birds. Or we used to have a net until my husband ran the weed trimmer too close and snagged the net and took it off. I had several plants with berries that needed about another week and I went out one day and they were all gone. Must have been the birds! For some reason the birds don’t go after my raspberry plants and they’re not netted. 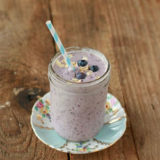 Oh my goodness, this smoothie recipe makes me so happy! I’ve actually got all those ingredients in the cupboard and fridge (this never happens!). I’m off to make it now. I love oatmeal smoothies because drinky things never make me feel full, no matter how many calories are in them–the only exception to this is oatmeal smoothies. Put oatmeal in a smoothie and I am full for hours. Oh, and I can’t wait to see what you do with all those raspberries! Making this tomorrow morning for breakfast. So pumped! Excellent smoothie, I did substitute with almond milk. This was fabulous! I used frozen blueberries and soy milk. I also didn’t have rolled oats so I used a packed of cinnamon flavored oatmeal. Its my new breakfast treat!